Don’t you just love skater skirts? I happen to think that they are both feminine and chic (not to mention comfortable as well). The skater style creates one of those classic silhouettes that transcends across time and seasons. Whether on a skirt or on a dress, this staple is flattering on any figure. Since the warm weather has hit southern California full force, I have been reaching for skirts, dresses and airy fabrics only which led me to this outfit. 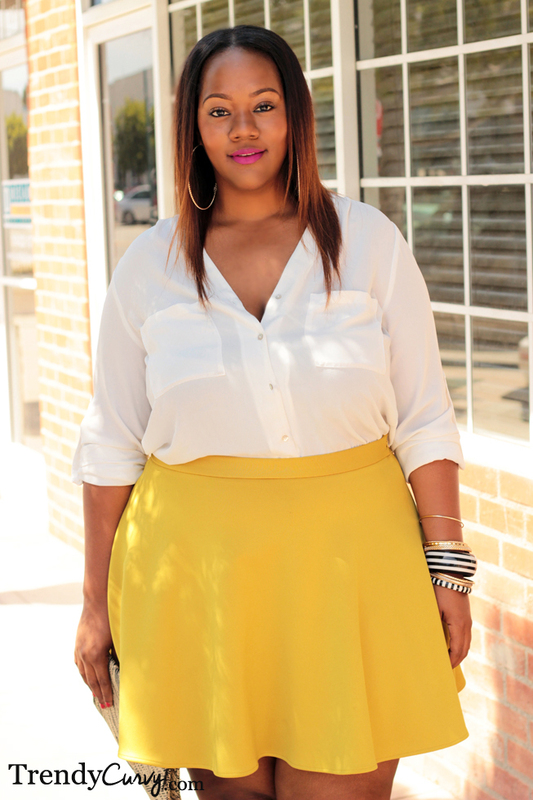 I paired this crisp white blouse with my yellow skirt to add to the easy and light feel that I was going for. 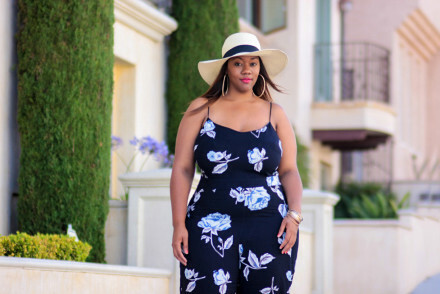 High heel sandals are definitely the best choice to complete this outfit but instead of going with a skin colored tan sandal (which is what I was originally thinking), I decided to add a little pizzazz with these fabulous black and white finds. 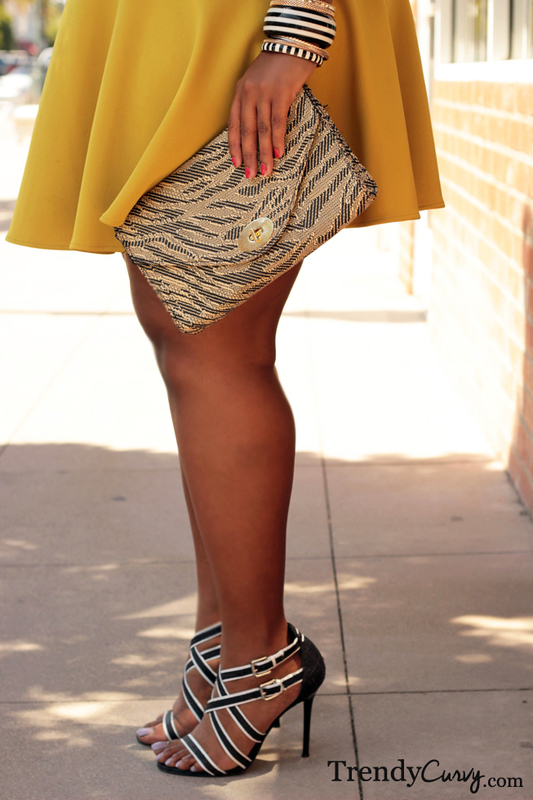 I complemented the shoes with my accessories to bring everything together. 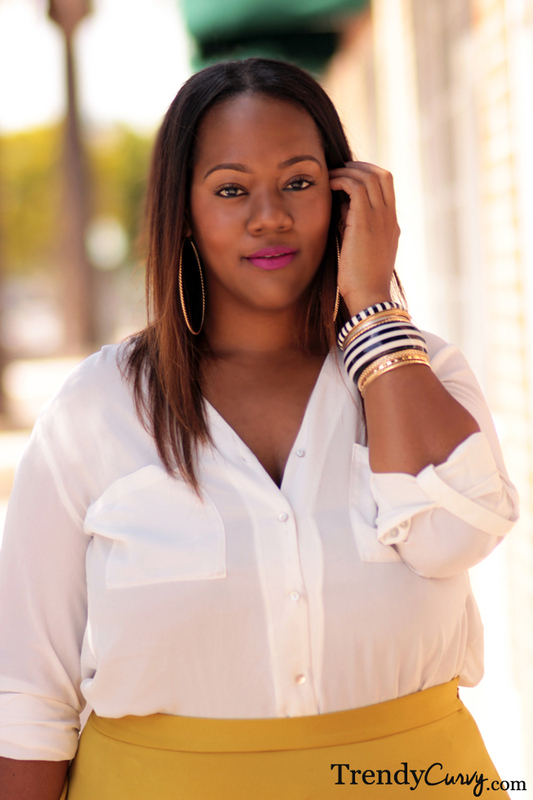 Overall I felt easy, breezy, beautiful…TrendyCurvy! Do you plan on selling this skirt I love it, I’m trying to search on the net but can’t find it. I’m not unfortunately, I love it too! I couldn’t find a skater skirt in that color but I could find it in other cute colors. Check Pink Clove and Asos. I love skater skirts since they exaggerate my curves. You look great, love the skirt and nicely put together outfit. Thanks so much! I love them too, they are so fun. I predict that I will be wearing a lot of them this spring/summer.